The West Seattle Totems Junior Rifle Team is part of the West Seattle Sportsmen’s Club. We have excellent coaches and the teens compete locally, regionally and nationally. Several of our shooters have gone on to shoot for college teams and some have earned scholarships. Participation is open to those age 10 to 20 years old, but our Coaches have the discretion to decide if your child is ready to take direction and handle firearms safely. This is to ensure the safety of all participants. To find out more or join, please email the Totems on our contact page or come down when they are practicing. 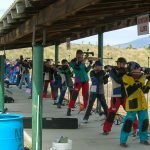 Our Juniors typically practice from 4:30 pm to 8:30 pm on Wednesday nights, but please check our calendar to make sure they are shooting that night.